Very thoughtful and respectful gave much needed support. Dear Mrs Humphries, Thank you for taking the time to leave such a kind review. We're happy to read how well Heather was cared for at our Biggin Hill Branch by Lucy. We pride ourselfs in ensuring our families and their loved ones are cared for with the upmost respect they deserve during such a diffcult time. Dear Gill, Thank you for such a kind review in regards to Lucy at our Biggin Hill Branch. Its lovely to read that you were looked after so well and by our Funeral team on the day. We're also happy to read you given all the support you needed during such a difficult time. Dear Kim, Thank you for taking the time to leave a kind review in regards to Lucy at our Biggin Hill Branch we really do appreciate it. Arranging a funeral isn’t something pleasant but with the help of Lucy from the Biggin Hill branch it was made that little bit easier. The day itself went extremely smoothly and everyone was so helpful and caring. I would definitely recommend Mears. Dear Caroline, Thank you very much for your kind words, we're pleased that everything ran smoothly on the day and all staff involved were helpful and caring. Lucy, Alan and all the team at Mears funerals were so lovely providing support and advice before and on the day of the funeral of our loved one.And the recommendation of Sally who did the reading for us at the chapel couldn't have been better she was perfect. Many thanks from Ray, Jean and family. Dear Raymond, Thank you for such a kind review in regards to Lucy at our Biggin Hill Branch as well as our Funeral team. It is lovely to read that you were well looked after by all our team at your time of need,and you were happy with our Celebrant Sally who officiated the service for you on the day. Again thank you for taking the time to leave a review. Very helpful, polite and efficient. Dear Andrew, Thank you for the kind review, we really appreciate it. Dear Dorothy, Thank you for taking the time to write a lovely review in Regards to our Biggin Hill Branch. We're happy to hear that you we're looked after so well by all who helped you at your time of need and kindness was shown throughout. Our dear son, Sean, died suddenly in Spain. Obviously we were devastated and knew not what to do. His partner in Spain, by chance, on the internet, contacted Mears Repatriation - London Biggin Hill Airport. We subsequntly met them, and initially impressed, agreed that they'd not only bring him home, but carry out the funeral as well. Steve Mears outlined the procedure, showing professionalism, compassion and efficiency, in perfect balance. Then passing us to General Manager Lisa McDemott, the painful process carried on in the same manner. Exemplary throughout is the only way to describe this company. We felt that if they could have taken our pain away, they would have. Thank you all. 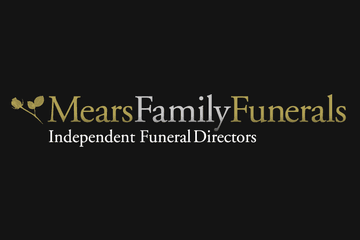 Mears Family Funerals. Biggin Hill will provide you with a free obituary as part of their service.